Here is a weeklong schedule for the benefit of tourists from China keen on visiting Kenya. With hundreds of thousands of animals expected to arrive in Kenya's Masai Mara National Reserve to graze later this month, in a phenomenon in East Africa known as the great migration, the country's tourism officials have intensified efforts to attract Chinese tourists. Last year, some 53,485 Chinese tourists visited Kenya, an increase of about 12 percent over 2016 and making China the fifth largest source market for Kenya. The Magical Kenya campaign has been launched online by Kenya Tourism Board and it is promoting activities such as safari tours in Masai Mara. The government agency has also opened an official account on Chinese app WeChat and has uploaded a promotional video on Chinese streaming site Youku. Usually it takes at least 15 hours to fly from China to Kenya. There are two weekly flights from Guangzhou to Nairobi, and a third is expected in July. That country's immigration department has trained officers to speak in Mandarin so that the process of granting visas at airports there is hastened. 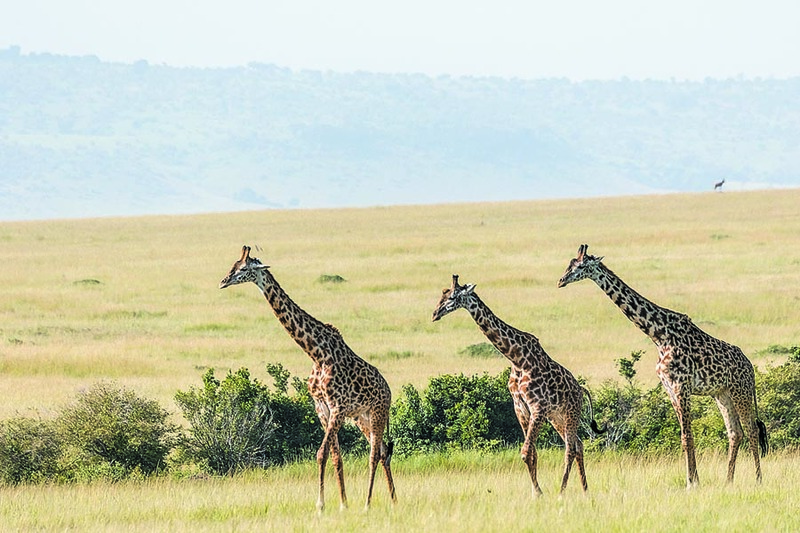 "You can apply for tourist visa online, it is very convenient," Wei Wang, a Chinese who works for Nairobi-based Long Ren Tours and Travel Ltd, said. Chinese tourists can also get visa on arrival. Once at Nairobi airport, the road trip of 16 kilometers will lead tourists to the city center, offering glimpses of life in the countryside as well as the urban hustle and bustle. After checking into a hotel, one can choose from a host of tour options such as viewing giraffes or visiting an elephant orphanage located near Nairobi National Park and managed by Daphne Sheldrick, the widow of the well-known game warden David Sheldrick. An entry ticket to the haven for elephants rescued from parks and reserves is 35 yuan (US$5) per person. Eating authentic Kenyan food for dinner while being entertained by traditional dancers might be a relaxing way to end the first day. The Nairobi Gallery - in the heart of the city and housed in an old government building - is available for those with a taste for art. Locals used to refer to the building, constructed in 1913, as the place for "hatches, matches and dispatches", as births, marriages and deaths were recorded there. The gallery is managed by Kenyan museums and showcases works by emerging African artists. An early morning departure from Nairobi will help tourists arrive at lunchtime in Amboseli National Park. The park is famous for being the best place in Africa to get a close view of elephants among other wildlife species at the foothills near Mount Kilimanjaro, the dormant volcano in the neighboring country of Tanzania. Other attractions in Amboseli include a visit to the Masai cultural village for an experience of the old culture. The Amboseli Lodge, located 2 km or so from the park, has rustic cottages in the middle of nowhere, and one can get an online deal as low as only 705 yuan (US$110) per night. After breakfast, a six-hour drive will get you to Naivasha in western Kenya's Rift Valley, where you can eat lunch at Naivasha Country Club hotel. Relax in the afternoon by visiting Hell's Gate National Park known to be the only national park in Kenya, where you can choose to drive, walk or cycle to spice up your excursion. A boat ride on Lake Naivasha can make your visit even better by allowing you to watch a variety of birds and hippos in the area. A two-hour drive after breakfast will see you arrive at the Lake Nakuru National Park, a bird lover's haven since it has more than 500 species, including one of the largest gatherings of long-crested eagles in the world. The park is home to rhinos, lions, leopards, hippos and the endangered Rothschild's giraffe. The park is also where the other great migration happens. Every year in Kenya, from April through June, flamingoes make their annual migration and descend upon Lake Nakuru and Lake Bogoria, blanketing the water in pink. They flock to the lakes because of the high alkalinity of water that nurtures algae for their chicks. Up to seven hours by road will take you across scenic fields of wheat and barley to Masai Mara. The 82-km road linking the nearest town of Narok to the park gate, once considered a rough terrain, is being constructed by China Wu Yi Co Ltd, a Fujian-based property enterprise. Estimated to cost US$19.9 million, the Narok-Sekenani road is scheduled to be completed in April. New bridges are being constructed, promising to cut down travel time by more than three hours. The firm also manages the Loita Plains hotel, conveniently located along the road. The hotel has a Chinese chef who whips up authentic cuisine for visitors after a long ride costing an average of US$20 per person. It is better to call in advance to ensure that they expect your arrival. The hotel has cozy rooms for visitors who are on a budget and would like to linger more for Chinese hospitality. Rooms go for US$60 per night. Alternatively, one can proceed to the Mara Serena, located inside the park. Another option is the AA Lodges with tented camps, and a game drive after the checking in. The park is renowned for the annual wildebeest migration, a natural wonder. The herds make the perilous journey from Tanzania's Serengeti National Park to Kenya's Masai Mara National Reserve from the months of July to September. One can view the wildebeest on the banks of the Mara River, where tensions build over days before and the herds start crossing and dodging the waiting crocodiles. But one might not catch the spectacle during their stay in the park as nature is unpredictable. The park, however, offers other attractions such as the black mane lion, elephants and buffalo, three of the "big five", although luck is essential for spotting the other two - the highly elusive leopard and the endangered rhino. This is in addition to antelopes, zebras and the Masai giraffes together with hyenas and vultures. Breakfast is usually followed by a full-day game drive in the park. There is always something new to see in Masai Mara, said Zhang Tong, CEO of the Beijing-based Zhongfa Group that manages AA Lodges in Kenya. "Actually, you can go for game drives everyday and have new experiences." Picnics can be organized for you while you catch a glimpse of the hippos and crocodiles sunning themselves. Later, a visit to a village to experience the Masai culture will make the safari memorable. An early morning hot-air balloon tour is also available that offers a mid-air view of the great migration, if you are lucky enough. One would catch an early morning game drive before checking out and taking the seven-hour drive back to Nairobi. But visitors are advised not to take long walks, especially along low-traffic streets. The city government allows a cultural market to be held in the central business district, at least once a week. Traditional products from Kenyan culture are displayed with bargain hunters having a field day. Some sellers speak Mandarin to communicate better with the growing number of Chinese tourists. The Industrial and Commercial Bank of China has launched a credit card in partnership with Kenya's Stanbic Bank to help Chinese pay for hotels and other services. It is also important to ask your preferred tour agent whether the itinerary provided includes park entrance fees, transport and game drives, accommodation at the campsites, meals and allowances for drivers and guides. A weeklong schedule for the benefit of tourists from China keen on visiting Kenya.